In just 346 miles, the Owyhee River ­flows through three states and some of the most remote country in the Northwest. Originating in Northeastern Nevada near the town of Owyhee, the river steadily pushes northwest through Idaho’s southwest corner, where it is augmented by the floatable and challenging South Fork of the Owyhee River (also a Nevada native) before crossing into Oregon’s southeast corner. From the state line the river continues northwest and collects the currents of several forks and tributaries before turning north and then northeast for its confluence with the Snake River near Oregon’s own town of Owyhee. So the river goes, beginning and ending in itself. Along the way the river drains approximately 11,000 square miles of land, making it the second largest of the Snake’s tributaries (the Salmon River drains 14,000 square miles). The Owyhee enjoys Wild and Scenic designation on 120 miles of river, which actually includes the Owyhee Dam. In addition, the North Fork Owyhee Wilderness, the Owyhee River Wilderness, and Pole Creek Wilderness were designated in 2009. Between the Owyhee’s length and its many forks, boaters have several options for scenic and exciting river trips. The stretch of river from Rome to Birch Creek or Leslie Gulch is an exceptional float trip usually completed in four or five days with easy access a BLM-operated boat ramp near Rome, Oregon. The take-out for this section is either Birch Creek or Leslie Gulch, and boaters must weigh the pros and cons before deciding which to use: Leslie Gulch has much easier road access and is absolutely beautiful in its own right, but it sits at the end of the 10-mile long Lake Owyhee. Slocum Creek Campground is near the boat ramp. Boaters who opt for the Leslie Gulch take-out frequently arrange for a motorized tow, and commercial outfitters often bring an outboard motor along with their trips. The Birch Creek take-out sits upstream of the lake, but its road access is extremely steep, rough, and requires four-wheel drive; rains are known to soften this road to the point of closure, which wreaks havoc on shuttle plans. The view of the Owyhee River and Pruitt's Castle from the banks above Rye Grass. Photo by Kat Dierickx. When it was constructed in 1932, the Owyhee Dam that creates Lake Owyhee was the world’s highest. Above this dam the Owyhee flows as freely as it has for centuries, though modern agricultural and irrigation demands do alter flows. This is generally a spring float that thrives on snowmelt and rain. Optimal river levels are usually pumping in March and April, and depending on factors such as snowpack, temperatures, and rainfall, floating can be doable as late as June, when the river becomes very technical. Spring weather in Eastern Oregon can mean blizzards and blissfully hot sun all in the same week (no joke), so boaters are advised to pack for both a winter and summer trip. At normal spring flows this river presents boaters with Class II-IV water. Whistling Bird and Montgomery are the most challenging rapids, and scouts are easy at both locations. During periods of heavy rains, expect to see rapidly rising water levels if you are in canyon sections. A brief list of some of the notable rapids on this run follows, but please consult a river map for specific locations and information. Bulls Eye, Class III-IV: A large boulder in the center is the bull's eye you should miss. Whistling Bird, Class III-IV: Current pushes toward an undercut hazard on river right. Montgomery, Class III-IV: Current pushes boaters toward the left wall and over two boulders. Owyhee River boaters can expect a full immersion into a remarkable desert river ecosystem. Red-winged blackbirds ring out from the reeds, swallows dart over the water and into mud nests, western meadowlarks sing to each other from opposite banks, and sage-grouse fan and dance among the leks; antelope speed across the plains and bighorn sheep gracefully move across the rocks and canyons; sage perfumes the air, and spring wildflowers such as lupine, arrowleaf balsamroot, and phlox add color to the grasslands. Simply floating along the river provides a sensuous feast, and side-hikes only enhance wildlife viewing opportunities. Hikers also have the opportunity to explore the many petroglyphs in the area, some of which have decorated riverside rocks for thousands of years. Lucky explorers may even find arrowheads, though it is imperative to leave them where they are found. Evidence of human habitation in this area extends back more than 10,000 years. 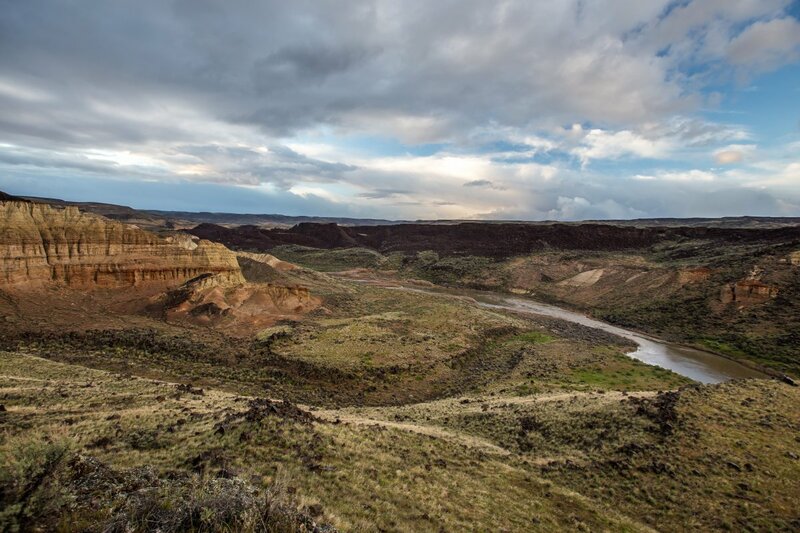 This stretch of river is also famous for the Iron Point canyon walls that vault above the river, but the jagged beauty of the Owyhee Canyonlands extend far beyond the river and also merits room for side hikes in your itinerary. Beautiful scenery. Advance permits are not needed. Short rafting season. Take-out access at Birch Creek can be difficult or impossible.